So begins, with magical imagery, Charles Dickens' Bleak House, the celebrated Victorian author's scathing satire on the Byzantine legal system in London. Dickens' tale, which was serialised between 1852 and 1853, guides the reader through the foggy dank streets of London to the maze of peaceful Inns of Court, where "lawyers lie like maggots in nuts" a stone's throw from the city's worst slums and criminal haunts. 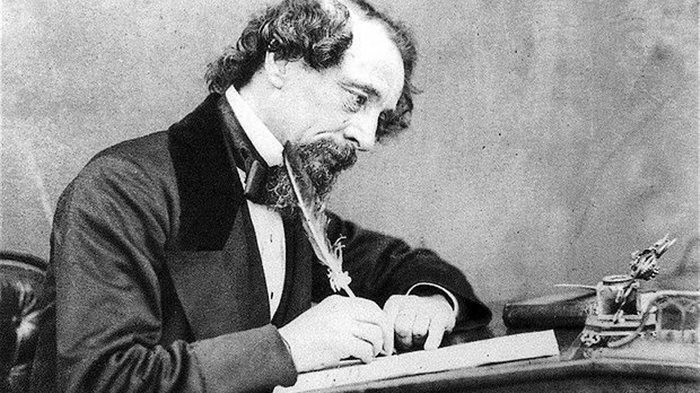 As a social commentator and urban novelist, Dickens was second to none, leading the essayist Walter Bagehot in 1858 to observe that Dickens described London "like a special correspondent for posterity". While Dickens managed to capture the joy and despair of the city during the injustices of the Victorian era, his acute depictions of London are ones that often still ring true today. Just moments after the evocative opening description of muddy Holborn Hill, the narrator of Bleak House takes issue with the area's pedestrians, "jostling one another's umbrellas in a general infection of ill-temper, and losing their foot-hold at street-corners, where tens of thousands of other foot passengers have been slipping and sliding since the day broke". Sounds a bit like rush hour today, does it not? Any UK resident with a TV and access to newspapers could not have failed to notice the spike of interest in Dickens in the build up to Christmas in 2011 - you'd be forgiven to think that Miss Havisham was a new celebrity pop singer in the mould of Lady Gaga. Underpinning this Dickensian eruption was the BBC's three-part series of Great Expectations, which cast Ray Winstone and Gillian Anderson as Magwitch and Miss Havisham. No sooner had the critically acclaimed production finished airing than the advance previews of this autumn's new film adaptation starring Ralph Fiennes and Helena Bonham Carter in the same roles hit our screens. There is, of course, good reason why Britain has renewed its love affair with Dickens: 2012 does not simply mark London's Olympic year, it is also the 200th anniversary of the birth of greatest novelist of the Victorian period. As such, there's a worldwide Dickens 2012 movement to commemorate the bicentenary of his birth, which fell on 7th February 2012. Although an international celebration of the life and work of the prolific writer, philanthropist and champion of the poor - with events going on all over the globe, from Albania to Zimbabwe - Dickens 2012 has at its epicentre the city which the author so wonderfully portrayed in the bulk of his work: London. Dickens' London is a gritty, unromantic place where fog and poverty rules supreme and corruption spreads like a bad waft. Despite the miseries of his youth in London, Dickens also had much love for the city in which he spent the majority of his 58 years. He routinely walked the city streets - sometimes for 10 or 20 miles at a time - and his descriptions of nineteenth-century London bring the sights, sounds and smells of the old city alive. Appearing on a recent online video about Dickens' London on the Guardian's website, the actor Simon Callow - a Dickens enthusiast - recalled how the writer's friends would often joke that wherever they went in London - be it Fulham, Hampstead or the East End - there, turning a corner, was Dickens. "He was everywhere and he still is in my imagination," said Callow as he traced some of the author's haunts around Covent Garden. "It was Dickens' delight to walk round London with friends or visitors and point out, as it were, Dickens' London. He was as much a myth as a man, even in his own lifetime. He celebrated his own existence in these places. It's remarkable how much of it remains intact." The best example of an intact piece of Dickens' London is 48 Doughty Street in Holborn. Located between Gray's Inn and Coram Gardens, this Georgian terraced house was Dickens' home for two and a half productive years following his marriage (during which he completed The Pickwick Papers and wrote the whole of Oliver Twist and Nicholas Nickelby, as well as fathering two daughters). Now the site of the excellent Charles Dickens Museum, this is the only one of Dickens' London abodes to survive. Dickens was actually born in Portsmouth, moving to Bloomsbury aged two before spending an idyllic early childhood in the Kent countryside. When his family moved back to London in 1822 it was to Camden Town - and so started the worst phase of Dickens' life. His father locked away in a debtors' prison, Dickens was sent to live with a boarding family that would later become the inspiration for the Garland family in The Old Curiosity Shop. An antiques shop by the same name can be found today on Portsmouth Street just off Lincoln's Inn Fields in Holborn, near to where Dickens worked as a legal clerk and court reporter. The white-washed timber building dates back to the sixteenth century and took the name "The Old Curiosity Shop" soon after the novel was released in 1841 as it was thought to be the inspiration for Dickens' description of his fictional antique shop. It's still open today - and well worth a gander. To pay for his board and help his family, Dickens was forced to leave school at 12 and work in Warren's Blacking Warehouse on Hungerford Stairs, near the present Charing Cross station. One of his co-workers, who knew all the shortcuts and tricks of the trade, was called Bob Fagin - a name immortalised years later in Oliver Twist. This unhappy period in his life was alluded to in his favourite and most autobiographical novel, David Copperfield. Years later, when Dickens was a successful publisher, the author set up his All The Year Round periodical offices on the first floor of a building in Wellington Street, opposite Waterloo Bridge, above what is today the aptly-named Charles Dickens Coffee House. In these years, when Dickens was at the height of his fame, he would recall those hard times while eating at London's oldest restaurant, Rules, which overlooked the warehouse. The Maiden Lane restaurant is still open today, championing British classics such as fish and chips served the old-fashioned way: in a newspaper. Newspapers and periodicals were the life-blood of Dickens, who made his name as a journalist and continued being one while publishing his novels in weekly instalments. Following the release of his father from prison, Dickens could finally finish his schooling and, on completion in 1827, he joined a law firm in Gray's Inn as a clerk, aged 15. Having learnt shorthand, he became a freelance court reporter and then a political journalist in Clerkenwell. These formative years in Dickens' career provided him with much material for novels such as Nicholas Nickelby, Dombey and Son, and especially, Bleak House (which takes place largely in and around the picturesque Inns of Court, much frequented by Dickens). As a journalist, social chronicler and keen devourer of London's pavements, a thirsty Dickens of course spent a lot of time in public houses - many of which still stand today. The most famous is the delightfully cavernous and rickety Ye Old Cheshire Cheese, whose gloomy charm captivated Dickens, who alluded to the Fleet Street establishment in A Tale of Two Cities. Beyond nearby St Paul's Cathedral (whose cross atop the dome is described as "the crowning confusion of the great, confused city" in Bleak House) and over the Thames in Southwark is the National Trust-owned George Inn - London's only remaining coaching inn - which often opened its doors to Dickens. Further down the river, The Grapes Inn in Limehouse was another Dickens haunt and featured in Our Mutual Friend as "a tavern of dropsical appearance". North of Hampstead Heath is the historic Spaniards Inn, which was mentioned in Dickens' first novel, The Pickwick Papers. The best way to experience Dickens' London today is to cover the city in the same way as Dickens himself: by foot. The Guardian website has numerous commentaries that you can download onto your iPod while following his footsteps. For organised tours, the guides at London Walks wear Victorian-style costumes as they lead guests down Dickensian alleyways on Fridays; the Walks of London website suggests free jaunts around the haunts and famous landmarks of the great novelist; while the Charles Dickens Museum hosts Wednesday evening walks which feature readings from Dickens' novels, facts from his life and a visit to one of his favourite pubs. The only surviving house the author lived in, the Charles Dickens Museum houses more than 100,000 manuscripts, rare editions, personal objects and paintings. Usually open 365 days a year, the museum was founded in 1925 after the Dickens Fellowship saved the building from demolition. Oddly enough for a museum that boasts the world's finest Dickens-related collection, 48 Doughty Street is closed for much of the Dickens Bicentenary owing to a much-needed £3.2m renovation project, dubbed "Great Expectations". During the post-Easter closure of 48 Doughty Street, the Museum of London will pick up the slack with Dickens and London, the first major UK exhibition of the author for over 40 years. Running until 10th June, the exhibition promise a "haunting journey" using sounds and projections to explore wealth, poverty, prostitution, childhood mortality and philanthropy in Victorian times. Located close to the Barbican Centre, the museum draws on paintings, photographs, costumes and objects that illustrate Dickens' work and manuscripts in his own hand. Other museums and institutions involved in Dickens 2012 are the V&A Museum, which hosts a bicentenary exhibition that draws on original manuscripts, printers' proofs, first editions and illustrations, focusing primarily on Dickens' favourite novel, David Copperfield; the British Library, which held a Dickens and the Supernatural exhibition until early March; and the National Portrait Gallery, whose Life & Legacy display charts the key aspects of the author's life, and includes his friend Daniel Maclise's famous portrait of a young Dickens aged 26. From cheap budget places to stay to luxury 5 star suites see our special offers for hotels, including Thistle Holborn, The Kingsley from 62% off.